Nail down the furniture, and hide the children... the fey are coming! This pdf is 14 pages, 1 page front cover and half a page is taken up by the SRD, leaving 12.5 pages of content. The pdf begins with 4 pages of introduction to the fey and the series. After that, we get an introduction to the fey that is written IC and from the perspective of a fey. The prose is actually well-written and introduces both a new kind of plane and provides a plethora of different ideas to include in your games and serves as a nice preview for the things to come. This book serves as the introduction to the series and subsequently does not provide new crunch, but rather elaborates on the concepts and does so in a fine way. The wealth of ideas is stunning and cool we get 13 new subtypes for fey as well as some elaboration on their rulers and how they come into being. The book essentially is a general ecology of the fey, including mindset, society etc. Due to this being an introduction, no mechanics are given yet, but I anticipate them in the next installment. This pdf is absolutely beautiful and adheres to the ZSP-horizontal layout. While the pdf is among the most beautiful I've ever seen, I think that a printer-friendly version would have been nice. While my color laser printer managed it, I think that other people may find it problematic to print out. The artwork is simply stunning, especially for the low price. Editing and formatting are good, although I've found an instance of a repeated word as well as a minor cut-copy-paste error. Don't let that detract from the wealth of information herein, though: I love the concepts presented within and am eagerly anticipating the follow-up books. Due to the minor glitches I encountered and one piece of artwork that didn't fit in with the rest, I'll rate this book 4.5 stars. This sumptuous visual treat opens with a Foreword by Jeff Grubb, in which he reviews the development of the legend that is the fey through history... after all, they were part of common consciousness and culture long before role-playing games came along! Over time, even in tales, they have been deminished from strange and capricious beings that must be propitiated to 'fairies' with insect wings that look cute: now it's time to regain their original role - more powerful than humans, less than gods but arrogant enough for a pantheon-full, determined to have their own way without regard for anyone else. Next comes In Defence of the Fey, a look at why fey have so far been under represented in role-playing games and the sort of obstacles that writing good material about them face (the reasons why fey don't feature quite as much as the authors think they ought to, of course!). Challenges include deciding just who the fey are, what motivates them and what purposes and objectives they have, what history do they have and why are so few tales of fey from other than mediaeval Europe drawn upon when creating in-game fey? All good questions and ones that need to be answered by anyone embarking on a project with the scope of The Faerie Ring product line. Finding those answers give a fascinating insight into the ongoing design process driving the project. One key point is that fey thought processes are completely different from anyone else's, hence their reputation for being capricious and cruel... to a fey, what they do makes perfect sense, it's just that the rest of us cannot understand their reasoning. The section ends with an outline of the intentions of The Faerie Ring, in the main a sourcebook but also a mini-setting, one which - if you choose - can be interwoven with the game world you are already using, adding the extra dimension that is the fey. The final section is The Realms of the Fey: An Introduction. Beginning with cosmology, this sweeps through the planes of existence to the home of the fey, the preternatural planes which weave around and through the material plane in dizzying arcs. Just what is going on, even scholars disagree. A sidebar gives the design reasons for having the preternatural planes: they're places in which literally anything can happen. If you want a given wierd effect, you can designate a preternatural plane on which said effect is the norm. Just like the 'otherworlds' the fey of legend inhabit. The discussion moves on to the fey themselves, considering some of the questions raised earlier like the origins of the fey and their underlying philosophies. Intriguingly, much of this entire section is written from the viewpoint of a fey scholar, seeking to explain his kind to the curious. Varied in their opinions and approaches, fey also come from a wide range of habitats, and exhibit a variety of anatomy and physiology (assuming you get one to stay still long enough for a detailed examination, that is). Some of the more common types are discussed, however, as well as some idea of the hierarchies of power in which they exist. And that's it, sufficient to tantalise, to make even the most jaded faerie-hater to want to discover more. The rest of the series has a lot to live up to. A word of warning, despite glorious appearance that still lets the words take pride of place, this is one to read on screen - both the landscape presentation and sheer amount of colour means that printing would be impractical. It's lovely to look at, though! Nice intro to the fey. Sounds very cool and nice cover art. I'm very tempted to buy this sight unseen. Fey are a major component in my current campaign, and a lot of the sales text sounds like it would fit in quite well with my current vision. Color me intrigued. Very intrigued. Yeah i dig fey, especially if they are dark, which I hope these are. I have it sitting in my shopping cart for the next time i can afford to buy stuff. @DM, The gorgeous cover illustration is by the quite talented Julie Dillon, who has done the majority of the illustrations for the first and second volumes already (yes, there's a second volume already in the works). Ok I broken down and bought it. I liked it a lot. I will do a review in the next couple of days, likely tomorrow but not promises. i did have a minor issue with the book. It is a very pretty book, but would be brutal to try and print. A print friendly version as well would be really nice. Oh and hurry up with the next part. I wish there was a book for this, I am not a fan of pdfs. But it does interest me, I like fey, both the good, the bad, and everything inbetween. @Dragon78, Unfortunately, the economics of print make that option difficult for such small businesses, especially on a color piece like this. So we try to make the best digital experience we can. That said, we are looking into it. Reviewed here and on ENWorld. it is a very pretty PDF though. Thanks for taking the time to review products, Dark Mistress! It always helps to know what the fans think is working and not working. Glad you like it, and thanks for reviewing it, Alzrius! Never fear, there will be 20+ CR fey lords in the book. I promise! It's my fault for not being clearer in the sidebar. My intended distinction was between high-teen/twenty-something CRs (just like the Demonomicon articles, and there are several examples of 21-23 in the PFRPG Bestiary 2) and the more likely thirty- or forty-something CRs of whatever a new epic system might look like. It was not my intention to suggest we would arbitrarily limit it to CR 20. I remember when the Demonomicon articles were released that there were always two camps of fans regarding demon lord CRs: those that wanted twenty-somethings so that they could end a normal campaign with them and those that wanted more god-like, 30-40 CR lords. So it seemed like an elegant fix to provide an in-game rationale for both. Plus, I'd like to create some actual "epic" material someday, and some "epic fey" seemed an interesting fit if a new epic system is ever made. Scott, thanks for replying to my review. I appreciate you taking the time to correct my misunderstanding regarding epic-level fey lords in upcoming Faerie Ring books. Reading over what you wrote, I was operating under the assumption that questions of how high-level to make "planar lords" and similar personages had been essentially resolved. I say this because James Jacobs himself resolved them, though without ever expressly saying so. That is, in the Demonomicon articles, the demon lords always had a CR somewhere in the mid-20s to low-30's. Demogorgon, being the strongest (as he was the Prince of Demons) was CR 33; every other demon lord had a lower CR proportional to how strong they were compared to Demogorgon. That, in essence, solved the question of how high-level the highest-level enemies should be in a system that didn't have a firm cap on leveling (that 4E has such a cap is one of the few things I respect about it) - notwithstanding gods - since you expect a degree of symmetry regarding similar "strongest" characters (e.g. presumably Asmodeus himself is of a CR in the low-30s, otherwise one wonders why he didn't kill Demogorgon, or why he wasn't killed by him, if the difference in power is too great; this goes for celestial lords, etc.). Likewise, while I can't link to any of them, I've seen statements from James Jacobs et al making it clear that this was their intention for Pathfinder in general and Golarion in particular. Nascent demon lords like Treerazer were in the low-mid 20's, and true demon lords were somewhere between the mid-20's to low-30's, just like the in the Demonomicon articles. I had assumed you guys at Zombie Sky knew that, and wanted to have your fey lords occupy the same CR range as full demon lords, but backed off because there were no official Pathfinder epic rules yet. Mea culpa there, and I'm glad to be wrong on that one. That said, it sounds like you're still keeping things on the lower-end for the initial fey lord write-ups. While it's probably too late to change anything, I'd personally be more encouraged if you kept them to the same high-20's-or-thereabouts that the Demonomicon adopted. As you said, the Bestiary 2 only goes up to CR 25, but surely smart guys like you can extrapolate from there. On a slightly-tangential note, for those who do want CR's that go higher, I don't think you can divide us (yes, I'm one of them) into just two camps. For example, the truly excellent Gates of Hell series from Dicefreaks goes all the way up to CR 81 (for Asmodeus himself - hence, that's the "cap" for how high their system goes). Likewise, the Immortal's Handbook series (which I'm very proud to have helped work on) can easily shoot creature CRs into the triple or even quadruple digits (while this does entail "reinterpreting" creatures such as planar lords and gods to some degree, it does provide an in-game rationale for how the highest-level creatures exist, and why they're often unknown to the weaker creatures of the multiverse). However you stat them, though, I look forward to seeing where The Faerie Ring goes! CRs 21-25 are the nascent lords, as you said, with full lords (typically demigods) having CRs into the high thirties. They leave the lords unstatted but hint at possible epic rules in the future. As to our fey lords, while I think there should be a certain level of parity between them and the lords of the outer planes, I think it would be a disservice to treat them identically. We're trying to give the fey a place of their own, so we want to make sure there are differences between them and the outsiders. Some fey lords--most sovereigns and some others--will also be able to boost their power to much higher levels, but it probably won't be automatic--maybe they have to do something special or possess something unique that allows them to get stronger for a time during which they may be able to match many outsider lords for a time, maybe even surpass them, but it won't be constant typically. These boosted stats will not be included in this book. If there are ever epic rules for PFRPG, though, we'd be happy to create the boosted stats in a follow-up book. Is this a cop out to not include "epic" level stats because Paizo hasn't created epic rules, yet? That's the fan's call to make. But we do want to play nicely with the rules that are there. We want fans to be able to use our content in conjunction with other existing PFRPG material. Any idea of a schedule for the next part? No rush. "When its ready" is good. But certainly looking forward to it. Presumably this would make a natty "flavour" addition to any Kingmaker campaign? So any word on when the next one might come out? We're working very hard to have the next chapter released for PaizoCon. Can't say definitively quite yet, but it's close. I had not seen this before. This is definitely something I must pick up. It looks beautiful. And eeek! I am sorry for other reasons that I had not seen this before. I did not mean to release a product with such a similar name. I apologize if I stepped on any toes. The Faerie Ring: Along the Twisting Way is in six parts: the prelude and five additional chapters. (At least a second volume is planned if people want it.) Each chapter (after the prelude) looks in detail at a specific fey lord and all that entails (much like the "Demonomicon" articles from Paizo-era Dragon). Each of these chapters is about half flavor and half crunch. The flavor fleshes out the fey and gives them a mythology and framework. Rather than a setting, though, it's more a "micro-setting": it's meant to be dropped right into your world of choice. At least half of the crunch is devoted to player options: there is a new fey PC race in each, for instance, and [redacted] magic and even a fey creature that can be a familiar. Then there are the other new creatures and items and incantations and such. There're are also things that will spill over into other lines, such as classes (you'll see that in another release at PaizoCon!). It's looking good that there will also be a series of fey adventures in the not-too-distant future that we're trying to work out now. I'm super excited about that because it's with a top talent, but I can say no more, yet. So, yes. There will likely be a bit of everything if you can wait a bit. For all my fellow Pathfinder fans, Zombie Sky Press just launched a giant source book for the fey... I mean the Fair Folk! It's the continuation of The Faerie Ring, and there's powerful fey lords, new fey monsters, fey player races and character options, fey planes and cities, and more. Tons of the wonderfully weird for players and GMs alike. 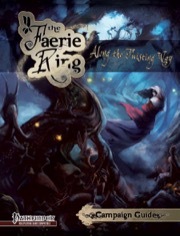 If people haven't checked it out yet, head over to the Kickstarter for The Faerie Ring. There's only 16 days left to get in on what will be an awesome book.